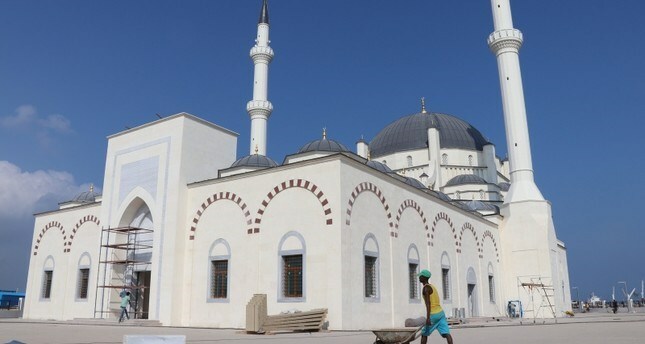 Turkey’s gift to Djibouti”, East Africa’s largest mosque being built in the capital city, is set to be inaugurated in two months’ time. The Turkish Diyanet Foundation (TDV) launched the construction of the mosque in 2017, which will be completed soon and inaugurated in February 2019. Modeled in the style of classic Ottoman architecture, the mosque majestically stands at a suitable area of 10,000 square meters overlooking the Indian Ocean shores near the Djiboutian presidential palace. The mosque has enough room for 5,000 people to pray at once, project manager of the construction, Furkan Kazım Yüksel, told Anadolu Agency. “There is also a green area, a courtyard, modeled after the Blue Mosque in Turkey,” Yüksel said adding that part of the mosque rests on the ocean, which made the construction very challenging. Two minarets jetting up to 45 meters each mark off one big dome and four small ones to give the cream-white mosque building an air of architectural grandeur. Inside, a low-hanging chandelier brightens illustrious Turkish hand-drawn patterns. “The compound also includes a quarter for teaching children,” he said, pointing beyond a fountain in the middle of the courtyard which he said would be used for ablution. According to Yüksel, most of the materials come from Turkey, including cut stones that are used in Ottoman-style buildings. He said that the mosque is “Turkey’s gift to the people of Djibouti” — a country with which Turkey came in contact in ancient times together with other countries and places in the Horn of Africa. “Our forefathers made contact with the people of this region in ancient times and I feel honored to be part of this project,” he said. Turkish Ambassador to Djibouti Sadi AltInok told Anadolu Agency that Turkey’s interventions in Djibouti — a small country of less than 1 million people — are not focused on the military, but on development and humanitarian support. In addition to the mosque, AltInok said, Turkey has carried out several socio-economic projects aimed at the benefit of the people. A pediatric hospital is in the pipeline and a water dam has been completed by 50 percent, he said, listing the several projects Turkey has launched in the tiny, yet strategically important country.